The Rossstock (2,461 m) is a mountain of the Schwyzer Alps, located on the border between the Swiss cantons of Schwyz and Uri. It lies on the range between Muotathal and Unterschächen, east of Lake Lucerne. ^ Retrieved from the Swisstopo topographic maps. The key col is the Rossstocklücke (2,288 m). 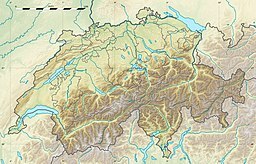 This Canton of Schwyz location article is a stub. You can help Wikipedia by expanding it. This Canton of Uri location article is a stub. You can help Wikipedia by expanding it. This page was last edited on 19 April 2017, at 19:35 (UTC).